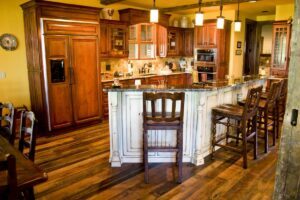 Fairbanks Custom Builders offers kitchen remodels and kitchen design services within all of the High Country communities including Blowing Rock, Boone, Valle Crucis and Banner Elk, NC. Whether you own a second home, vacation property or you are a year-round resident, Jay and his team can work with you to create the dream kitchen of your wishes. Your kitchen should reflect your lifestyle. Start by thinking about how you use your kitchen and what you need and want on a daily basis. Create a wish list, find out what’s available and choose backup options. Learn how to shop for materials and products that fit the goals of your kitchen remodel and get a realistic idea of the costs. Don’t just choose new cabinet, drawer and pantry organizers – choose the right ones. A kitchen renovation isn’t for most weekend warriors. It can take weeks or months to complete and might involve a general contractor, designers, plumbers or even architects.